This holiday allows the traveller to experience two completely contrasting places; a vibrant, bustling confident city where ancient meets modern and an area famous for its surreal scenery, wealth of ancient churches and unparalleled opportunities for adventure activities. 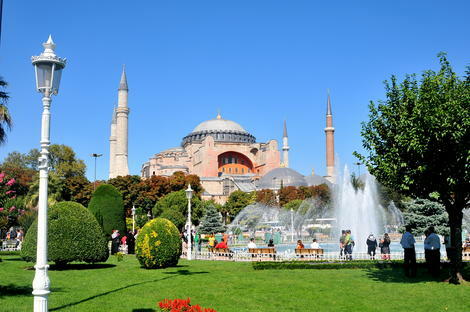 Istanbul is an ancient city where ‘east meets west’, ‘ancient meets modern’. It has a feeling of confidence in its own wonders both old and new and is city of energy and innovation. There are so many ‘must do’ experiences to be had that it will leave you wanting more and one trip is never enough. Istanbul is an eclectic mix of languages, cuisines and cultures due to its geographical position, as the capital city for both the Roman and Ottaman empires it is a city steeped in history. Visits to the world famous sites in the old town will fill you with a sense of history. The Byzantine architecture of the Hagia Sophia museum, a UNESCO world heritage site, is simply stunning as is the Topkapi Palace. No visit to Istanbul would be complete without a visit to the glistening Blue Mosque, an architectural triumph with its six slender minarets, huge courtyard and of course the brilliant blue tiles that adorn its interior. An active mosque visitors cannot fail to sense the sacred and serene atmosphere that exists inside. Now you are fortified to wander through the Grand Bazaar with its labyrinthine streets stuffed full of stalls, the atmosphere is chaotic and frenetic yet exhilarating. You can spend hours here! You can also meander through the Egyptian Spice Bazaar, which a feast for the senses, with its vibrant colours and heady mix of herbs and spices. And if all that isn’t enough why not catch a ferry along the Bosphorus and cool yourself in the balmy breezes. Cappadocia is a compelling tourist destination. The area’s most extraordinary phase was during the medieval era, when the valleys were a refuge for Byzantine Christians. The Göreme Open-Air Museum, a World Heritage site, has the best collection of chapels and living quarters, most dating to around the 11th century. Within these rock-cut churches visitors can view the superbly preserved fresco paintings. Cappadocia has a lunar-like landscape where the religious Troglodytes set their houses and churches into stone cliffs and built their cities underground. Hot air ballooning is a fantastic way to experience this geological wonderland, as you float high above the valleys you can see just how erosion has moulded this area of Turkey. The region’s conical rock formations are known as ‘fairy chimneys’ and it is like something out of a storybook. The undulating landscape is a haven for walkers and can be experienced close up by taking a hike through its spectacular rose-tinted gorges. To sample a great cross-section of both cultural history and natural wonder, pull on your hiking boots and stride through the valleys yourself. There are companies offering fascinating guided walks through this spectacular scenery. Three of the best valleys to explore are The Red and Rose, Zemi Valley and Cat Valley. The interlinking Rose (Gulludere) and Red (Kızılçukur) Valleys are two of Cappadocia’s most interesting and the easiest to access. Trails lead across surreally-shaped ridges, through water-sculpted tunnels, and down into narrow basins hosting rock-cut churches (kilise in Turkish) surrounded by orchards and farm plots. There are plenty of signposts allowing easy navigation and walkers can choose everything from a one-hour stroll to an all-day hike. Staying in Cappadocia today doesn’t involve any hardship or subterranean chambers as many cave dwellings and fairy-chimney chapels have been converted into boutique hotels, where you can try the troglodyte lifestyle in luxury. You’ll quickly discover what the locals have known for centuries that the rock keeps rooms cool in summer and warm in winter. If its upmarket hotels and fine dining you want then you need look no further than Urgup. This area is very popular with travellers due to the development of boutique hotels in the town’s honey-coloured stone buildings, left over from the pre-1923 days when the town had a large Greek population. With a spectacular natural setting and a wonderful location at the very heart of central Cappadocia, this is one of the most seductive holiday spots in the whole of Turkey. Cappadocia is a fairy-tale land where life still follows a village rhythm, far removed the marvellous mayhem of Istanbul. With this holiday you get to experience both. Author Bio: Ramadan is the founder and managing director of Direct Traveller, a UK based leading specialist tour operator offering tailor-made holidays. Working in the tourism industry since 2002, Ramadan is passionate about travel. Having travelled extensively himself and been responsible for many holidaymaker’s individual arrangements, he offers informative insights for travellers. You can learn more about Ramadan by visiting his Google+, Facebook, Twitter. 3 Important Lodging and Accommodation Tips for Thrifty Travellers Colombo, What You Must Do? Are Bean Bags The Perfect Seat For Hobbyists?